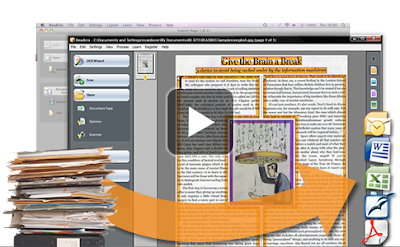 Do you have a task of converting eBooks into text but you don’t have enough time to input it one by one . Off course you must use an OCR Software. OCR (optical character recognition) is the mechanical or electronic translation of scanned images of handwritten, typewritten or printed text into machine-encoded text. Here are some of the best free OCR software you could found in the web. If you have a scanner and want to avoid retyping your documents, SimpleOCR is the fast, free way to do it. The SimpleOCR freeware is 100% free and not limited in any way. Anyone can use SimpleOCR for free – home users, educational institutions, even corporate users. TopOCR supports digital cameras, smartphones and scanners, and can recognize 11 different languages. TopOCR has a user configurable camera filter that you can customize for a particular camera or smartphone.It is different from other OCR software that you can also do some simple editing with TopOCR. FreeOCR is a totaly free Scan and OCR program, it is very accurate and can OCR PDF files. It includes a Windows installer and it is very easy to use and supports multi-page tiff’s. JOCR enables you to capture the image on the screen and convert the captured image to text. It is useful to revive the protected files whose text can not be copied. JOCR enables you to copy text from any files and images on the screen such as protected Web pages, PDF files, error messages. If you have Microsoft OneNote already, you needn’t OCR software, you can use MS OneNote’s OCR feature. You might have forgotten it, it is “Copy Text from Picture”. But it is not a very great tool to recognize handwritten characters or even fuzzy ones.